Arizona’s sunny weather, clear skies and soft breezes give residents of Mesa mobile homes an exceptionally enjoyable environment for golfing. This explains why golf-lovers from around the world settle down in the heart of Mesa. Mobile homes for sale at Palm Gardens prove to be picture-perfect habitats for snowbird golfers as they are just a hop, skip and a jump away from Mesa’s idyllic golf courses and resorts! This serene course is a great place for both the casual golfer and veteran golfer looking to get back in the swing of things. Visit Sunland Village’s quiet, relaxed setting to appreciate the beautifully maintained terrain and kind customer service. Customer service is the name of the game at Augusta Ranch. This conscientious golf club made its name in the Mesa area on their willingness to provide patrons with thoughtful adjustments like making accommodations for golfers with special needs. Celebrated as one of the best courses in AZ, Las Sandas is where seasoned golfers tee off to test their mettle and prove their precision on the course’s spotless green. Las Sandas’ masterful layout makes up for the club’s premium price point. Called “The Springs” by the golf club’s regulars, Superstition Springs’ rolling hills are bound to captivate and entertain golfers of every skill level. Elegant course design combined with the club’s luxurious event hosting services; place Superstition Springs Golf Club at the head of the pack. Painted Mountain Golf Resort makes the top the of Palm Gardens’ list of the best Mesa golf courses because it offers the best of both worlds: diverse courses for golfers of all skill levels and abundant menu options for when it’s time to return cart and caddy. Both features come at a reasonable price for almost any budget. 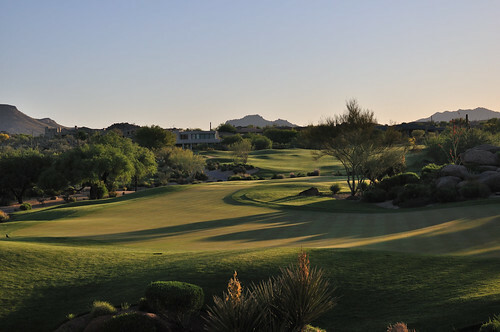 Our Palm Gardens residents get to enjoy the convenience of living a putt from the best golf courses in Mesa. Mobile homes are ideal home bases for your next Arizona golf course adventure.